Weather brings its own set of elements providing unexpected emergencies and you need to be prepared for them. Hurricanes and storms can strand you in your car on the side of the road, or at a job site. You can lose power and heat, or even your entire home and shelter. Any of these situations can be life threatening. 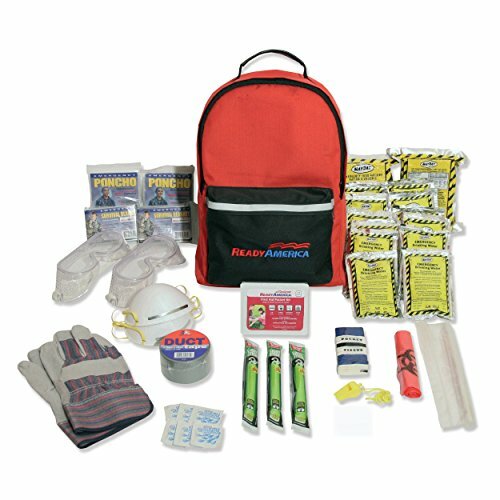 Be prepared for what Mother Nature dishes out with a Ready America Hurricane Emergency Kit. Our two-person kit contains 2) 2400 Cal Food Bars, 12) Water Pouches, 2) Emergency Ponchos, 2) Survival Blankets, 3) 12 hr. Lighsticks, 2) Niosh N-95 Dust Masks, 1) Tissue Pocket Pack, 1) Emergency Whistle, 1) Pair of Leather gloves, 2) Pair of Safety Goggles, 1) 10 Yd. roll of Duct Tape, 1) Bio-Hazard Bag, 6)Pre-Moistened Towelettes, 1) 33pc First Aid kit, 1) Document Holder and 1) backpack. If you have any questions about this product by Ready America, contact us by completing and submitting the form below. If you are looking for a specif part number, please include it with your message.